In an age where music can be downloaded in a flash, and where saccharine pop and RnB collaborations appear to be dominating the album charts, side walks “Damage and Joy”. 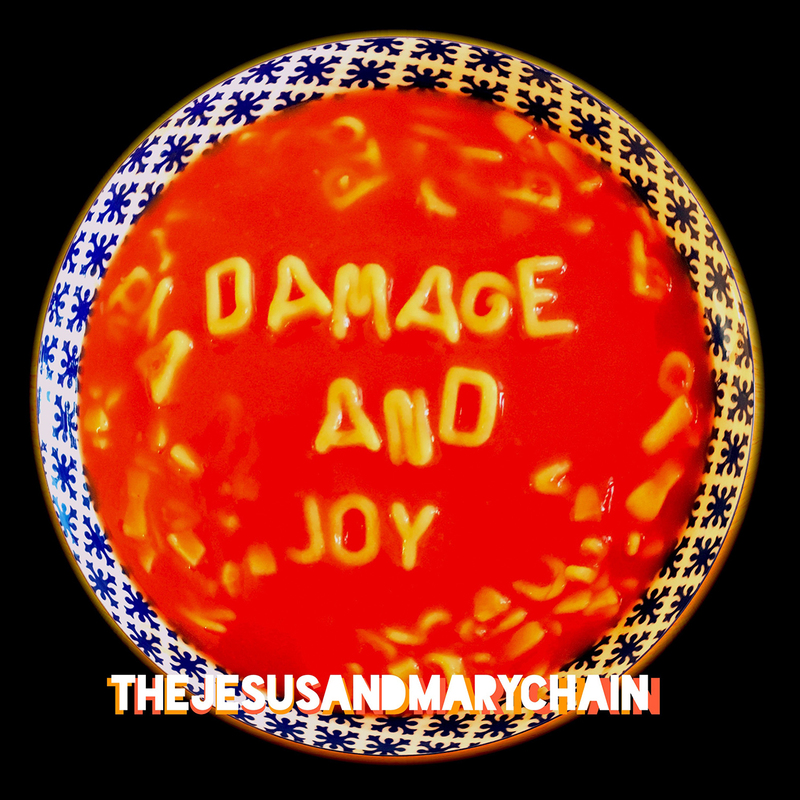 Released on 24th March 2017, “Damage and Joy” is the much anticipated album by noise-pop pioneers The Jesus and Mary Chain after a 19 year gap from their last album, “Munki”, released in 1998. Produced by Killing Joke’s Youth, including guest appearances by touring drummer Brian Young and Lush bassist Phil King, the Reid brothers have taken a quantum leap into the technological age of instant gratification, where music is often over-produced with technical short-cuts and where originality is less prevalent. Yet here is an album which is immaculately produced, whilst maintaining a raw, fuzz-rock ambience. It’s a natural progression since its predecessor, “Munki”, remaining loyal to its musical roots, and whose Noise-pop DNA is spread across every atom, imprinted within every iota of sound. It’s a paradoxical album, whose title, “Damage and Joy”, is a double-edged sword, which signifies a duality of changes, a revival and series of rebirths. It’s an album, produced with gritted teeth, with a sheer bloody-mindedness and familiar dark humour and Stoner-shoegazer’s skyline, that is less bleak but still glazed with bluesy angst. Including collaborations with Sky Ferreira, Bernadette Denning, Isabel Campbell and Sister Vanilla Linda Reid, “Damage and Joy” is fuelled by the complex dynamics of the Reid brothers, with brutal sentiments, emancipation and tender sentimentality. It’s an album that consolidates its harmonic distortions and shrieking drones, with The Jesus and Mary Chain remaining true to themselves without sounding jaded. It’s an album which doesn’t disappoint, with each of the 14 tracks strong enough to be a potential stand alone single. 1) With its wayward drones and scribble riffs, “Amputation” merges from the mire, blowing the dust storms away from a desolate and barren land. Along with the shrieks and throbbing bass, “Amputation” remedies its loss through the cool, collective narrative, ooing its mantra, with customary sardonic wit. It’s a great opener which sees JAMC slowly awakening from their hung-over hiatus. 2) With its translucent tinkles and telescopic tones, “War and Peace”, is vaporously melancholic, whilst side-saddling like a space-cowboy. It’s a sublime track, whose languid landscape is galvanized by the honey-stung tempo, shoegazing at the moonbeams whilst crashing through the hammering beats. 3) With its flickering drones, pitter patter synths, reverberating droplets, metallic shrieks and grazy riffs, “All Things Must Pass“, scruffles through the soul smog with combative composure. It’s a tumultuous transition, whose raw lyrics encapsulate the brittle beauty and pierce through the sorrowful core. Along with the stabbing beats and frenetic riffs, “All Things Must Pass”, accelerates into a frenzied departure, whilst remaining true to its noise-pop self. 4) “Always Sad”, takes JAMC back to the melodic, curving hooks of “Stoned and Dethroned”, and whose duet with Bernadette Denning is reminiscent of “Sometimes Always”. It’s a great track, whose candy-coated lyrics have been exhumed from the goth vault of post-punk. Along with the rattle percussions, descending riffs, pensive interludes and pounding beats, “Always Sad”, is a great reminder of old school JAMC, infused with a contemporary mix. 5) With its jangly riffs, taut tingles, brooding bass, locked beats and unravelling harmonies, “Songs for a Secret”, is a captivating and luscious track. Draped in a chimerical backdrop, “Song for a Secret”, sees Belle and Sebastian’s Isobel Campbell synchronise her soft tones with Reid’s vox , creating an exquisite and wistful soundscape. Along, with the overlapping vocals and the aloof chimes, “Songs for a Secret”, drifts into a dream-pop maze, tangled by the mesh of drones while lifted by the pounding euphoria. 6) With the sturdy and jangly riffs, “The Two of Us”, zig-zags across a symposium skyway, mediating between the bloom of youth and entwined by eternal love. It’s a heart-felt song that exhilarates and soars, reuniting Isobel Campbell with Jim Reid on vocals. Through the bassy drones and industrial clangs, “The Two of Us”, wears its post-punk heart on its sleeve, whilst crystallising its soul through the pure and endearing lyrics. 7) With the stripped down acoustics, “Los Feliz (Blues and Greens)”, JAMC slams, glides and quivers in a sombre sensorium. It’s a slow burner, whose lyrics are sun-drenched in sultry sarcasm. Along with the orchestral sweeps and trumpet splodges, “Los Feliz (Blues and Greens)”, migrates effortlessly into a sunnier climate. 8) With its prodding, angsty riffs, “Mood Rider”, prowls, halts and nonchalantly saunters through the twisted reverberations. It’s JAMC dragging their heavy load through the murky interstates, hanging precariously by the jangly threads, whilst side spinning it’s angular riffs. 9) “Presidici (Et Chapaquiditch)” is an upbeat, nostalgic catharsis, whose tightly gripped riffs rotate and reflect its 70s glam and glitter. It’s a sentimental track, whose heartfelt lyrics space-hop and pogo-jump away from the shadows into the light. 10) “Get on Home”, sees Space Cowboy Jim voyage across a stellar sky, shooting asteroids with his “Pistol in a pocket”. It’s LSD life Jim, but not as we know it, tripping over the jagged riffs, while dodging the sonic comets and sliding on the descending bass lines. It’s a synth-rock fusion, which sees JAMC, scramble the noise-pop cosmos and edge at radial velocity. 11) Previously released in a different incarnation by Freeheat, “Facing up to Facts”, lives in the shadows and sits in the recesses of JAMC’s blackened soul. It’s a sepulchral snake that rattles, scrapes and slithers into the cavernous pit, squibbling in between the twisted and spiked riffs. Devilish and despairing, “Facing up to Facts”, is JAMC personified. A cacophony of abrasive angst, wallowing in the gloom whilst screaming with puerile rage against the stabbing beats. 12) “Simian Split”, is a kooky, off-beat, menacing conundrum, an ironic take on Cobain’s suicide. Stylistically disjointed, “Simian Split”, sees JAMC rumble and stream its oboe-esque synths, adjacent to the lurking riffs. With its Eastern synths, “Simian Split”, backtracks in retrograde, orbiting around the unhinged coils and hammering beats. It’s an acerbic leap into a zany frontier, that reaffirms JAMC, very much as an experimental band. 13) With the reverberating acoustics,“Black and Blues”, downcasts its shadows from the crypts of the soul. It’s gloriously melancholic, which sees Jim Reid duet with songstress Sky Ferreira and descends into the doldrums. Like blackened Beach Boys, Reid and Ferreira harmonise simultaneously against the sinking riffs, hollow clangs and shrieks. 14) “Can’t Stop the Rock”, jangles its bluesy, curving riffs and brooding bass against a steadfast soundscape. It’s a one-shot wonder, whose deadpan dual vocals of Reid and Sister Vanilla, stumbles and stomps into ghostly neo-psychedelic harmonies aside the zig-zag riffs. It’s a great album closer, which echoes the evolution and triumphic return of JAMC.